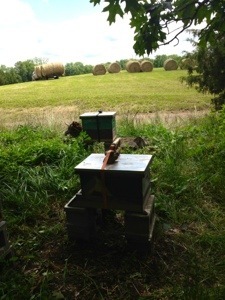 Apicentric beekeeping…I’m still figuring out what that means but that’s my ideal and goal. The bees haven’t given up on me yet. Our farmette is home to one to five hives at a time, depending on losses and build up. 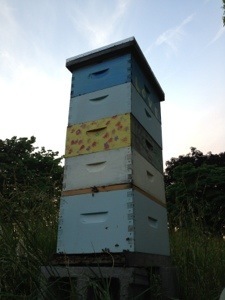 We usually maintain two or three in our half acre chicken yard & home apiary. I garden the other acre and a half with them in mind. There is nothing else like going to the beeyard and sitting next to a hive. The sweet smells, varied activity, and alternating sounds provide a place of fascination and peace for my family and me. It’s like aromatherapy and science lab all in one. 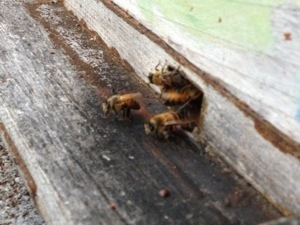 A beeloving friend has welcomed two other hives at his farm. 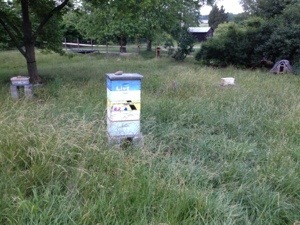 It is the first off-site O’ Aces apiary. I’ve slowly adjusted to having hives away from home. At first, I worried since I couldn’t see them everyday. I visited them several times a week on my way home from work, dragging my husband with me to weed whack or check for wildlife. I felt like I’d abandoned my bee-kids and spread out my heart strings. I strapped the hives for fear of bears…or cows. They’ve done well and I’ve gradually gotten used to those girls being away from home. They have their own life there, full of forest and clover fields and the occasional tractor rumble. Keeping bees has been an accidental personal journey. They have changed how I see the world and my place in it. I never expected that to happen when I read my first beekeeping book or signed up for the local class. As soon as I met my first package of bees, I realized this was going to be something more than I’d imagined.